A rich oily wrapper contrasted with a sweet finish of spice and almond best describes a Kristoff Cigar. The Cigar Aficionado has sought out to find a cigar made with the same spirit and craftsmanship that authentic Cuban Cigars have delivered and Kristoff Cigars do just that. They basically are legal Cuban Cigars, they are that good. Featuring Habano Cuban-seed wrappers and the best Cuban-seed tobacco from Nicaragua, each cigar is carefully hand wrapped to perfection. 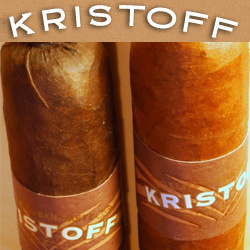 At CigarLiberty, we always have the best price on Kristoff cigars. Top recommendation: try the Kristoff Criollo or the Kristoff Maduro cigar. Both are some of the best selling cigars out there.